St. Francis was the founder of the Franciscan Order and is the Patron Saint of Ecology. Following the example of Christ, he lived in poverty and preached the Gospel to all around him. For California natives, such as myself, St. Francis is automatically associated with the 21 missions built by Franciscans in the Golden State. These missions trace back the Spanish heritage of California, as well as the Catholic influence that came along with it. As a young child, I looked in awe at the architecture and beauty of the missions with their adobe bricks and Spanish-style roofs. But the life of St. Francis is about more than good design. He lived a life of poverty but was actually born into a wealthy family where he spent his youth in riches and spoil. Known as the troublemaker of the town, Francis’ life would change following his time as a soldier in the Italian Army when during a battle between Assisi and Perugia, Francis was captured and imprisoned for a year. During his time in prison, Francis’ visions and experiences (like an encounter with a leper) pointed him in a new direction. (His father wanted him to be a soldier or a businessman.) Proving that the way you grow up does not set in stone the future, Francis soon fell in love with the ways and teachings of Jesus Christ. Francis’ conversion led to great generosity when he stumbled upon the church of San Damiano outside of Assisi during a pilgrimage. Unfortunately, the church lay in a dilapidated state. Within the church, Francis heard the voice of God calling out to him to fix it. Francis, in rejection of his past life and answering God’s call, took all his luxurious clothes and sold them — much to the dismay of his father, who disowned him afterwards. The money from these clothes went straight into rebuilding the old church. Go outdoors for your workout — St. Francis loved spending time in nature. Instead of hitting the treadmill in the gym, go outside and run on a trail. Go for a bike ride. Take a simple stroll. Just spend some time outside. Not only will you get a workout, but you’ll get fresh air and experience nature. Simplify your stuff — St. Francis gave up all his possessions and lived life as a simple hermit. You don’t necessarily need to go as far as that, but do look at the material things in your life that seem to be collecting dust rather than being used. These might be books, excess clothes or shoes, knickknacks and more. Gather the things you don’t need or use regularly and donate them to a charity. Volunteer in your community — St. Francis gave time to help rebuild the church of San Damiano. Find a charity or organization in your community where you can volunteer your time. If you love animals, volunteer at an animal shelter. If you like working with kids, volunteer at a tutoring or after-school program. There are many organizations out there that need volunteers — don’t forget your local parish!Maybe one of these programs will capture your heart. Once the work on San Damiano was finished, Francis took on the task of helping to fix the wider Church, specifically the corruption that had taken over. Francis encouraged all those he met to give up their material possessions in contrast to the corrupt Catholic leaders of the time who owned treasures and land. Francis’ practice was based on a Gospel story with Jesus preaching that disciples were to own neither gold nor silver. According to Francis, the leaders had strayed from Christ’s teaching. His bravery inspires people to this day to stand up to authority when power is in corrupt hands. 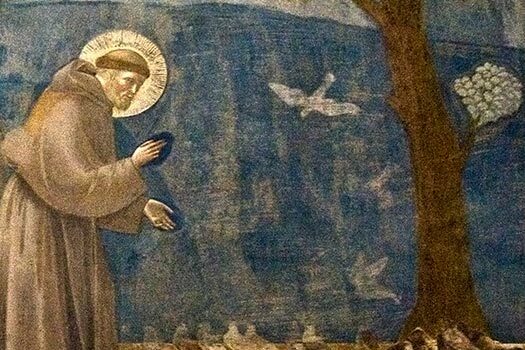 St. Francis would eventually be named the patron saint of ecology. He looked upon nature and its beauty as a wondrous creation of God, which needed to be treated with respect. Some stories of Francis even go as far as detailing how he preached the Word of God to the animals in the forest. Close to the end of his life, he would write Canticle of the Sun, detailing his reverence for nature, believing it to be closely connected to God. Francis’ intimate relationship with nature can be tied to the fact that he lived in extreme poverty, choosing to pray, reflect and even sleep outdoors. Next time you find yourself in a beautiful place in nature, imagine how St. Francis looked upon it with God’s love in mind. Toward the end of his life, Francis believed so much in his cause that he kept pushing himself to the margins of society. In his final days he lived as a hermit. Franciscans today try to emulate Francis’ spirit of community with the rest of the world. The majority of them live together in simple communities, still respecting nature and living a life full of the teachings of Jesus Christ. St. Francis’ example and spiritual practices still resound with us today. His devotion to the teachings of Christ, love and respect for nature, and struggle with corruption are as relevant today as they were back in the 13th century. 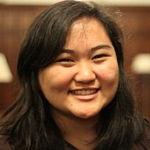 Vicki originates from sunny San Diego, but she's living and loving life in New York City as a recent Fordham University graduate and as an HR/Executive Assistant at her first job! In her spare time she loves to explore New York City, especially the food and theatre scene.